I finished Meg Wolitzer’s The Interestings last night and was so bummed out by both the ending and my own reaction to the book that I immediately had to start something more upbeat (in this case, Rainbow Rowell’s Eleanor & Park, which is excellent so far) in order to take my mind off of The Interestings before going to sleep. And now I need to figure out whether I liked or disliked this book, because it could go either way. This was one of those books, like Jennifer Egan’s A Visit from the Goon Squad, about which I had heard a tremendous amount of buzz before I read it. However, unlike AVFTGS, I didn’t put off reading this one until everyone and their mother had read it. Instead, I snapped it right up onto my Kindle shortly after it came out. However, all of the aforementioned buzz was both a blessing and a curse in terms of my enjoyment of this book. At first, I had read and heard only positive reviews. This novel had been compared to Jonathan Franzen’s Freedom and Jeffrey Eugenides’ The Marriage Plot and, well, they had me at Eugenides. Barrie Hardymon, a guest contributor on one of my favoritest podcasts, NPR’s Pop Culture Happy Hour, raved about the book, and I tend to like her suggestions, so all systems were go. And, indeed, as soon as I started reading this book, I loved it. And then, along the way, things started to change. First, a very brief plot summary of the book: the story starts off at a summer camp for the arts in the Berkshires in 1974. A group of smart, privileged teenagers who enjoy, variously, music, pretentious literature, animation, drama, and weed, come together as friends and deem themselves “The Interestings.” (This opening, while obnoxious, nonetheless rings true, because don’t all teenagers labor under the delusion that they and their friends are The Most Interesting People in the World?) The novel then traces the lives of these five friends — Jules, Ethan, Ash, Goodman, and Jonah — over the next forty-odd years, as some excel and others flounder. This book has a lot of great stuff in it. I bookmarked so many passages on my Kindle that I can hardly choose which ones to share, because Wolitzer’s observations about life are all so on-the-nose. I read several reviews that describe this novel as “astute,” and that’s a perfect word to use; Wolitzer, through her prose, nails so many universal human experiences and emotions: jealousy, dissatisfaction, early love, sadness, euphoria, nostalgia. Wolitzer’s best observations, though, are around friendship and marriage. I absolutely loved a scene in which Jules, a character through whose perspective much of the novel is filtered, and her husband Dennis go out to dinner with their lifelong friends Ethan and Ash and another couple that Ethan and Ash are friends with. Ethan and Ash are now much wealthier than Jules and Dennis, and Jules is acutely aware of how different the two couples’ lives have become, especially when it comes to new friends. There are also a lot of trenchant observations about feminism, which are illuminated through the female characters’ struggles to find balance among career aspirations, motherhood, and marriage. I also enjoyed Wolitzer’s descriptions of the ways in which various characters reckon with their need to be — or at least, to feel — interesting, special, and unique, even into adulthood. Like I said, Wolitzer packs a lot of great stuff into this book, and manages to keep things interesting (pardon the phrasing) despite the large scope of the book (40+ years, competing plot-lines, etc.). So there’s a lot of Good here. So “The Interestings” gets bogged down with long-winded explications and gratuitous, self-serious and often awkwardly phrased historical references: “It would be ten years before the notorious case in which another prep-school boy attacked a girl in Central Park. . . . And it would be thirteen years before a young female investment banker out for a jog in the park at night was raped and beaten into a coma.” The writing here has all the weary cheerlessness of a participant approaching the end of an all-day charity walkathon. Ouch. After reading that, I started to notice that, yes, Wolitzer does try to infuse the characters’ lives with historical meaning, or at least to situate every one of their life events into some larger cultural trend, which gets irritating, and feels unnecessary and forced. But these reviews didn’t point out what bothered me most about the book, and that is the focus on the character of Jules, who Wolitzer paints as the sort-of, almost, kinda heroine of this story. I found Jules hard to take and didn’t understand, despite what I suspect was meant to be a sympathetic portrayal of her, why she had friends at all. Jules to me was grating, insecure, boring, needy, and remarkably unspecial. Even when Jules made observations that rang true to me, I attributed those observations to Meg Wolitzer rather than to Jules Jacobson, which was probably not the intent of the author. I felt that Wolitzer’s sympathies with Jules were misplaced; to me, there were far more sympathetic characters available in Ethan or even Jonah. What’s most baffling to me was the fact that Ethan Figman, the only member of the troupe of Interestings who actually met with wild success as an adult (and, arguably, was the only one ambitious or talented enough to pursue such success), carried an undying flame for Jules throughout the book. What started off as a fairly inexplicable teenage crush at camp evolved into a deeply inexplicable non-requited love into adulthood; Ethan thought Jules was just the bees knees, and I just don’t understand why. It’s like Jules is a Mary Sue but without any of the good qualities. Finally, the book’s lumbering, depressing end, with more tragedy than was perhaps strictly necessary, left me feeling deflated. I don’t demand a happy ending from every book I read, but the ending of this book felt particularly hopeless. I like a teeny bit of redemptive hope tucked into any depressing ending, and I didn’t find that here. Did I hate this book? No. Did I love it? Well, yes, parts of it. But overall, The Interestings was a mixed bag for me. Final verdict: I would recommend it because mostly, it was a good read. It was packed with sharp observations and the characters’ stories did carry emotional weight. But the book was unsatisfying to me in two key ways: its putative heroine, who was disappointing, and the ending, which was depressing. Still, this book made an impression on me, and the fact that I’ve written so much here trying to sort out my reactions to it is probably a sign that it’s worth picking up. 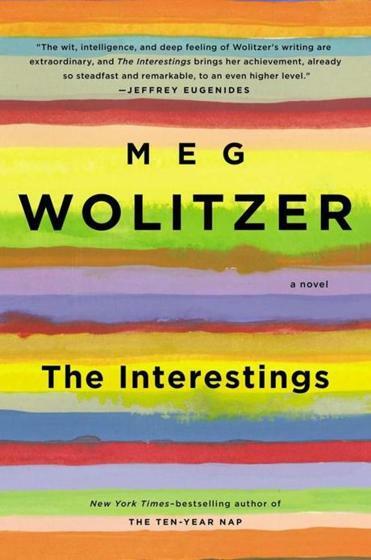 This entry was posted in Books and tagged books, Meg Wolitzer, The Interestings on April 30, 2013 by Stephanie. I am 2/3 through listening to The Interestings. So ready for it to end. Engaged enough to want to know what happens but dread finishing it as it has become tedious. It appears to have a few tragic & sad twits to come. I found your review because I was looking for a review WITH spoilers!! You review was helpful & honest- honoring the author with no spoilers. :). Still hope to find out how it all plays out but know I won’t finish it. I will however pick the copy of Freedom waiting for me based on your reference in this review & The Marraige Plot. Ah, I can’t vouch for Freedom. I was more using that as an example of a book that got an enormous amount of hype after it came out. I enjoyed The Marriage Plot but that book is really divisive; a lot of people hate it. In my eyes, though, Eugenides can do no wrong, and I’ll read anything he writes, so I’m perhaps not the best judge. I’m sure you can find spoilers of The Interestings if you google hard enough. 🙂 Hint: SOMEONE DIES. I was really looking forward to reading this as it came highly recommended. But the dialog just became so predictable for me. I put it down, read something else, reengaged, (repeat). Then I found myself 200 pages into the book and still felt the same. I felt as if the author was trying for a version of Forest Gump with all the references to historical events and inventions. Ugh. I really can’t wait to finish (40 pages to go) just because it ends tragically and it may be the only part of the book I will like. But, as someone else said before me….I don’t get the draw to Jules, and I didn’t even like her nick name all the way through the book. We give those special “names” to special people and she was duller than a butter knife. Yeah, the forced historical references bothered a lot of people. I found them unnecessary, and I think there are ways to place characters in time without doing hackneyed call-outs of major news items, untied to any action in the story. I’m not sure if the tragic end will redeem the book for you, unless you hate the characters so much you want to see them suffer, haha! Glad I’m not alone in thinking Jules was a dud. I agree with this review–not only was Jules ultimately not a very compelling protagonist, I thought that the Wolf family could have stood a little more scrutiny and skepticism. When Dennis finally snaps and tells her that the Wolfs aren’t all that great and the gang not that interesting, it was satisfying–but came too late, and in the context of the scene, seemed more like part of the things one says in a fight than any kind of deeper truth about the world and people Jules is obsessed with. It just seemed that the author lacked distance from her characters ultimately–is she aware that they are not that interesting and Dennis is a truth teller…or is she as fascinated by them as Jules is? Hi! I Just finished “The Interestings” and I really loved that book. Being born in 1958 it was interesting (here it is again) to compare the lives of the protagonists with my on life. So I didn’t think the hints on major historical events were hackneyed. They were helpfull to present an orientation in time. Actually I was able to empathize with the characters as they were going through the same times as I did, starting with intellectual literature (Günter Grass) and folk-music in the 70s. Anyway, in my opinion this is a wonderful book about finding a way through life and a great description of the factors that influence everybody’s individual way, such as talent, luck, envy, money, fate etc.. So for me it was a very fulfilling read. And I didn’t think that Jules was dud, because, hey, what shall 90% of the people do? Kill themselves? No, she had a talent of listening, counselling and dealing with problem-kids. So, actually, she is interesting, like everybody is in some way. Greetings from Germany.